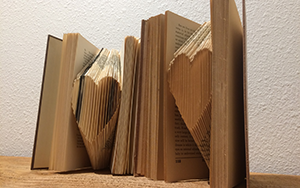 Book folding is a relatively new art. I have always loved books, and it breaks my heart to have to get rid of them. But now you don't have to! 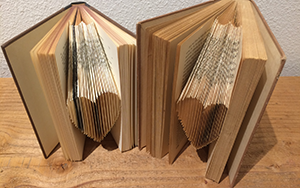 I can teach you to repurpose books and bring them to life again by folding their pages into sculptural designs - how creative is that? This book folding class comes just in time for Mother's Day. Learn how to create a heart shaped design for that special loved one in your life. Just bring yourself. All materials supplied. All materials included with a $5 materials fee paid to the instructor on the day of class.